Geeze...US 99, what the hell was going on there? I think that I tracked down the alignment history within Seattle as best as I could. I've seen multiple sources saying 1st Avenue was signed as US 99, but I'm not seeing any evidence of it on any map references that I've looked at. I'm also seeing US 99A on the Viaduct on maps in 1956 and 1966, so was it really ever the mainline route of US 99 or did it stay on 4th Avenue until was decommissioned? 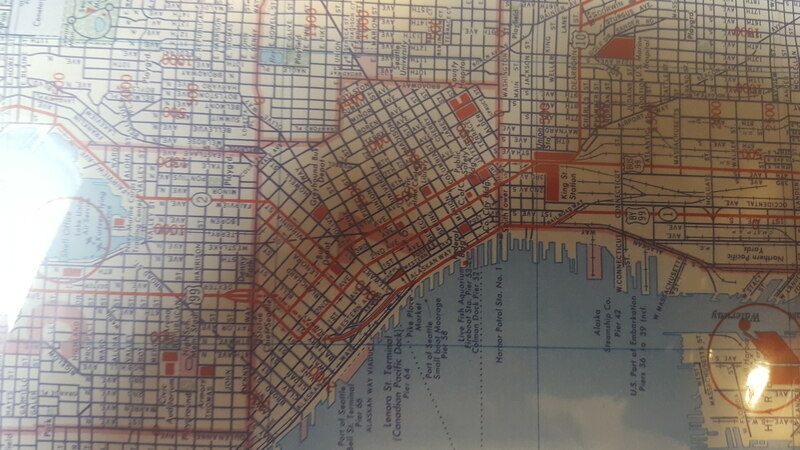 Without some additional maps from the late 1960s I couldn't make come to a ultimate conclusion what was going on with US 99 related to the Viaduct. If anyone has any answers or some sort of material that I could use to make an update it would be most welcome. Exactly what I was looking for. 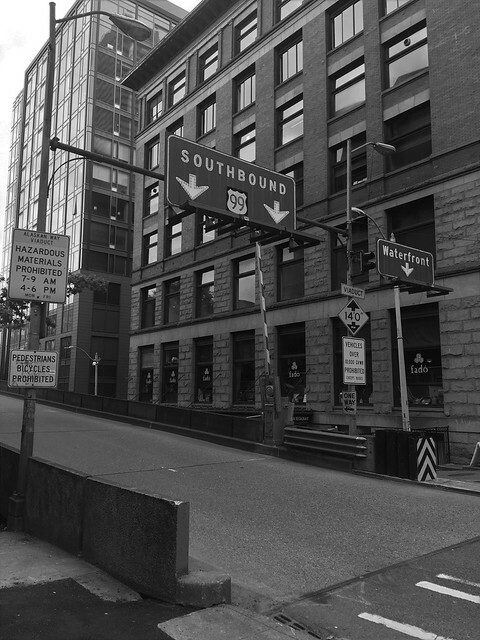 That narrows the shift of US 99 out of downtown and onto the Viaduct sometime between 1966 and 1969. Here's a map from 1957. It shows a Bypass and a Business 99 through downtown and the industrial area. 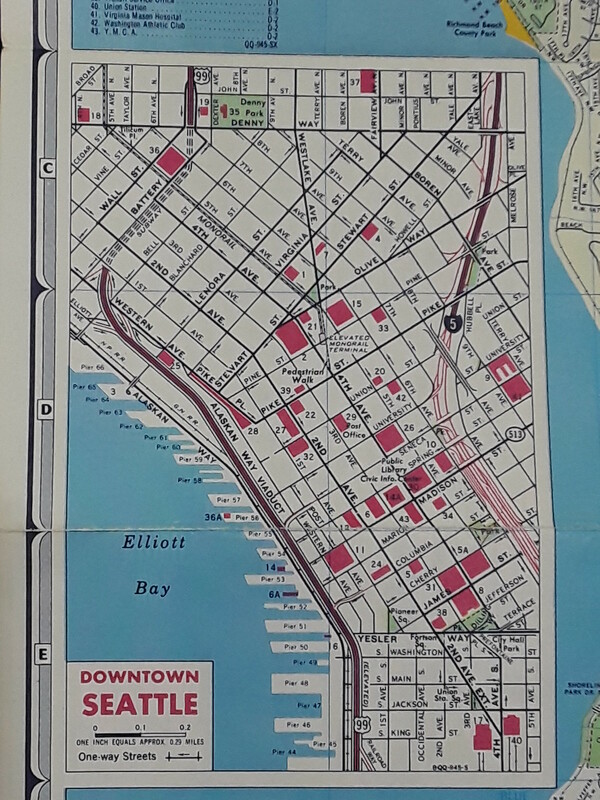 Bypass 99 followed 1st Ave S, Railroad Way, and Alaskan (the map shows the viaduct and Battery Street tunnel complete north of Stewart Street). Business 99 follows 4th Ave S, 2nd & 4th through downtown, then Battery & Wall to get to Aurora. It doesn't show any 99 on East Marginal between the 1st Ave S Bridge and the downtown waterfront. Presumably that was changed once the viaduct was fully complete past where the stadiums are now. 4th & Westlake; 1950s judging from the cars and train billboards. Notice the US 10 shield under the Coke ad. If 99 ran down 4th, then they wouldn't need to keep 10 running up 4th, until it can finally terminate with 99 at the north end of the Battery Street Tunnel. Also notice the neon "WAIT" sign on the far left. 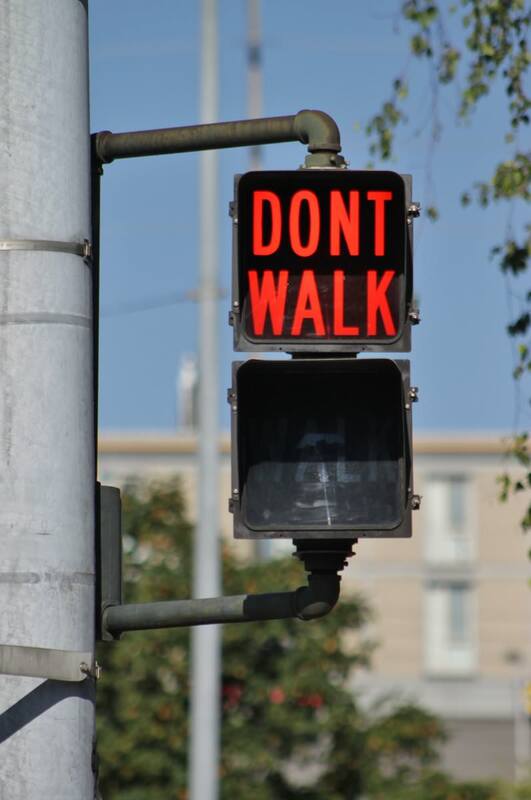 Seattle used to have neon "WALK" and "WAIT" signs. Is that a US 99 shield above the US 10? I want to say the car in the center lane is a 1959 Chevy Impala which would put it a more traceable time period. USends.com actually has US 10 being extended through downtown on 4th Avenue, maybe the surface route (whatever it was) as co-signed? Cosigned with 99 Business. 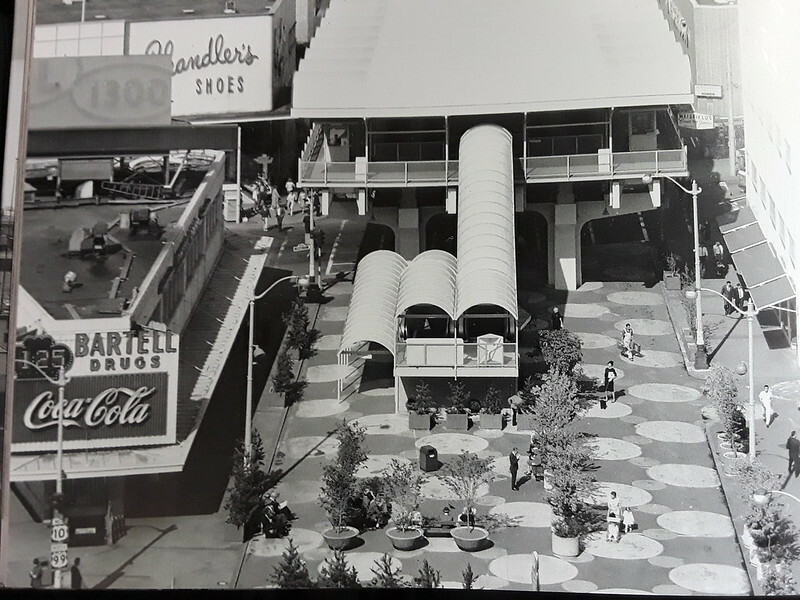 I don't have it handy, but in the book Lost Seattle, the entry for the old Westlake monorail terminal has a picture of this same intersection, which clearly shows a US 10 shield and a US 99 shield with the word Business squeezed onto the shield (rather than bannered). Basically, either once the viaduct opened (the first section was in 1953) or the Battery Street tunnel (in I believe '55, but I'm finding one page now that says '54), US 99 moved onto the new highway. It might have been signed Bypass at one point like my map, but honestly I doubt it. The surface route became 99 Business (might have been Alternate instead at one point, but it was definitely Business by the time US 99 disappeared), and US 10 was also extended along the surface route so that it still met mainline 99. I happen to have Lost Seattle, and here's the picture. It's a little easier to see directly from the book, though the word "business" is a little fuzzy. I just got back from my second trip to the Seattle Area. I added a southbound drive, a couple pictures of the Alaskan Way seawall and an over look above the tunnel to the Flickr album. I'll be updating the blog this week based off the US 10/US 99 Business photos. They used to be more focused on traffic deaths back when those pictures were taken. Seattle traffic deaths to date. Notice the VW Karmann Ghia on the left, the back end looks like the 1955-1959 make. The Milwaukee Road is advertising their Olympian Hiawatha, which was discontinued in 1961. The Great Domes were added to the Empire Builder in 1955. Monorail guideway construction on 4th Ave. began in April 1961 and there's no evidence of even the construction areas being fenced off here. - Southbound road photos for the Battery Street Tunnel and lower level of the Viaduct. - Photos of the Alaskan Way Seawall. - A photo of 1st Avenue and Railroad Way approaching the Viaduct structure. - Relevant photos provided in this thread related to the history of US 99 and the Viaduct. From one of the maps you cited, it appears that US 10 was routed around the south side of the Lake. I wonder if there is any information on this corridor. US 10 was removed so long ago that there is very little trace of its existence. What route did US 10 follow between Seattle and the I-90 corridor? Essentially it was on the WA 900 corridor south of Lake Washington. I believe that changed when the Murrow Bridge opened if memeory served correct. Yep. Hwy 900 was the main route between the pass and Seattle. It changed names a couple times, before being overlaid by US 10 in 1926. The original bridge (today's eastbound lanes) opened in 1940, and US 10 was transferred to that. Before the opening of the floating bridge in 1940, US 10 (the Sunset Highway, also Primary State Highway 2) traveled via SR 900 through Renton. This route was opened in July 1915, following one of the old railroads across Snoqualmie Pass (now part of the Iron Horse Trail), up through Blewett Pass to Wenatchee, then across modern US 2 to Spokane. A branch of Primary State Highway 2 traveled up Eastlake Avenue, Roosevelt Way, Bothell Way (modern-day SR 522), and onto modern SR 202 to provide an alternate way around the lake. US 10 and PSH 2 were moved onto the floating bridge and the Renton route became a branch of PSH 2 (and later signed as US 10 Alt). After the renumbering in 1964, it became SR 900 and the western segment between I-90 and Tukwila on MLK Way was removed in 1991.